Harry Palmer‘s Subway Art Show took place last night. He’s doing it again tonight and, if you’re awake at 1.30am, I’d highly recommend you go along. To draw it down to the basics Harry found some artwork done by schoolchildren in the 90s framed on the walls of a subway which fascinated him. He uses this as the basis for his work, trying to understand the history of the pieces, what they mean and how they fit into his mindset. And much more beside. The event pretty much consists of Harry talking about himself and exploring the artwork along with the graffiti that covers it and you find yourself studying the walls in more detail than you’d have though possible. The fact that this takes place in the middle of the night when Bristol Street is at its quietest adds to the otherworldly atmosphere. As we left Harry in the subway I looked back and wondered if the whole thing had actually occurred, if Harry even existed. Very odd. I’m failing to do it justice, typing this at 3.30am, but yeah, if you’re able do go. It could be one of the most unique art events of the year. Details here. Hello. I’d like to thank Pete and friends for attending last night. 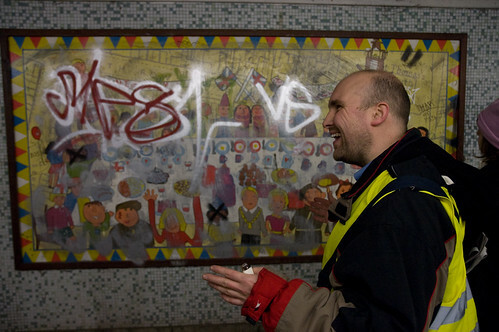 I was impressed by the willingness to be at my Subway launch at 1.30am, to delve a little into my world of Bristol Street Subway. Much appreciate the photos and postive review from Pete. This evening, there will be another ‘launch’ at 1.30am (24th Jan 08- ealry hours) at the same location. Look forward to meeting people there. I personally found the ambience most suited the stillness of the city, a lack of distractions and anxiety that is so associated with any city, let alone a Subway, made for a relaxed description and tour of the work i am involved with. More site of special social interest exhibitions , albiet in a more peculiar and continued fashion, are ongoing throughout 2008. I’ll certainly keep people informed. I email out from plot40@hotmail.com – so please get in touch should you want to.